Your boxes look like a lot of fun. For some reason, I am not much interested in boxes. Mom left some out for me to play with, but I have ignored them. 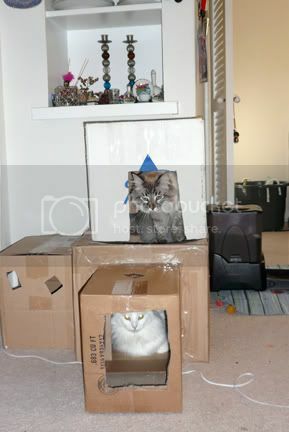 We love boxes too, and now we want a fort too!! Great news about Hope! Paws crossed she continues to improve. Sending lots of purrs and healing Light. We LOVE your fort! Boy, our human has never made one for us; we're jealous! We have not had a really good box since Christmas, Lucky! You would think we would have had all kinds of boxes moving, but they were all full of stuff! Full boxes are No Good! Glad to hear that Hope is getting better. And that box fort looks super. Maybe our bean will build one for us. That would be so much fun. Have a great week end. We still purring for you to ge all better soon! We love boxes too. Your fort is cool!! We're really happy to hear that Hope is better!! Boxes are super fun! We have several! That is the coolest box fort ever! Wow that is the coolest box fort! We are totally jealous! Our mom was going to make us one but we kinda trashed the big box so we just keep using it as is. We love boxes - they are awesome! And we are glad that Hope is doing better! That is very good - but we are still sending her purrs and prayers, just to be safe and sure that it continues!